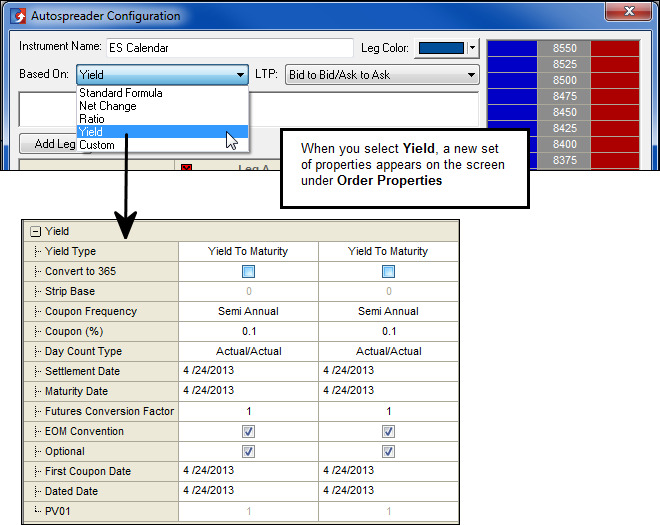 You can trade fixed income and interest rate spreads as a difference in yield using the Based On property in the Autospreader Configuration dialog box. You define the Yield properties for each leg of the spread. The properties are identical in function to the User-Defined Price (UDP) column in MD Trader. The configured spread prices display in yield in the spread pane. The legs display the defined yield in the UDP column in MD Trader. Converts 360 days to 365 days. Average settlement price of the contracts in an exchange traded Strip, Pack or Bundle. The Strip Base is added to the instrument price before the conversion. Number of coupons per year. (Annual, Semi Annual, Quarterly, Monthly) Default value is Semi Annual. Annual interest rate (as a decimal). Must be greater than 0.1 and less than 100.00 and accurate to four digits. Default value is 0.1. The convention used for counting the days between two dates. The default value is Actual/Actual. The date the trade settles. Must be less than the maturity date and greater than today. The redemption date of the bond. Must be greater than the settlement date and greater than today. The factor by which the futures price is multiplied if the specified bond is delivered against it. Must be greater than 0.1 and less than 5.0 and accurate to four digits. PV01 Sets the PV01 value used to convert the quoted NPV value of an Eris Invoice Spread contract to its corresponding par rate. The PV01 is calculated, first, then entered in this field to display Eris NPV prices in terms of Par Rate in the Autospreader price ladder. This field is only available in Autospreader when Display is set to “Par Rate”.